The bark of P. africana is popular in traditional medicine, and this species is over-exploited in at least half the countries it occurs in. 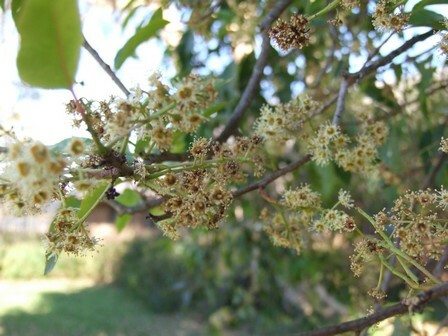 The popularity of P. africana bark in South African traditional medicinal trade is increasing, and there has already been a 50% population reduction in KwaZulu-Natal, where it is now locally extinct in more than half the forests it used to occur in. Tree densities in South African forests are low, and is reported to be declining or scarce in at least 40% of quarter degree squares it has been recorded in. It is inferred that a reduction in the South African population will exceed 30% within the next 60 years, as a continuation of population declines in the past 60 years (generation length 40 years). Surveys indicate that subpopulations are small, with between 40 and 400 trees per quarter degree square, and based on this evidence it is suspected that the South African population does not exceed 10 000 mature individuals. Due to the overexploitation and decline of this species elsewhere in the range, the national assessment is not downgraded. Widespread in Africa from the southern Cape, through KwaZulu-Natal, Swaziland and northwards in to Zimbabwe and central Africa and the islands of Madagascar and Comoros. Evergreen forests near the coast, inland mistbelt forests and afromontane forests up to 2100 m.
A sought after medicinal plant which has been critically over-exploited for bark products over much of its distribution range, especially in Cameroon, Madagascar, DRC, Kenya and Uganda for the international trade (Scott-Shaw 1999; Cunningham et al. 2002). In other countries, exploitation tends to be restricted to local user groups, and the species isn't commercially exploited in South Africa yet (however, Neil Crouch has had enquires recently from an Italian company). The quantity exploited annually for export to Europe ranges between 3,200 - 4,900 tons, and this is the largest volume of any African medicinal plant in international trade (Cunningham et al. 2002). Two-thirds of the exported volume is from Cameroon, and as many as 7717 trees were harvested between December 1984 and December 1985 from one site in Cameroon (Cunningham and Mbenkum 1993). 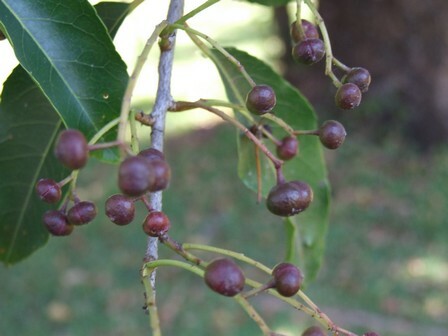 Prunus is vulnerable in Malawi and considered of a lower risk in Zambia (Grace et al. 2003). Trade has been devastating on wild populations because P. africana is restricted to 'islands' of Afromontane forest. These 'islands' have been further reduced through habitat destruction. Threats due to the international bark trade are unlikely to disappear and will continue to grow since there are no chemical substitutes for Prunus africana bark (A.B. Cunningham, pers. comm., 2008) Medicinal Bark Harvesting: In South Africa, bark harvesting tends to be on a smaller scale compared to other species, possibly because of its general low abundance. Cunningham (1988) classed the species as 'declining' in KwaZulu-Natal - i.e. 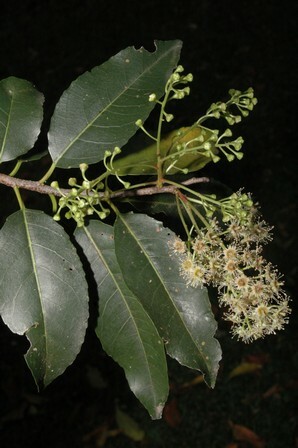 a species that was once widespread until recently and was likely to become vulnerable and continue to decline if destruction of wild populations continued for the medicinal plant trade. 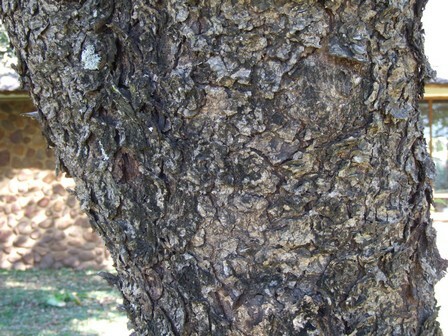 The tree is heavily exploited for bark products in various forests in KwaZulu-Natal (e.g. Umzimkulu, Hughly, berg and mistbelt forests, Hluhluwe, Louwsburg) (M. Ngwenya and C.R. Scott-Shaw, pers. comm., 2008). There is a tendency for the bark to be difficult to find in the Durban markets (N.R. Crouch, pers. comm., 2008). In Johannesburg, less than 30% of traders in the muthi shops and Faraday market sold what could have been Prunus africana, but may also have been Rhus chirindensis. 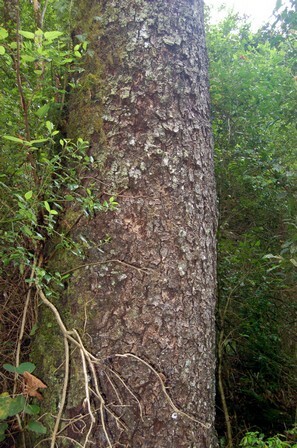 Geldenhuys (2004) recorded bark harvesting in the Umzimkulu District, and found Prunus africana to be one of 36 tree species stripped for bark. 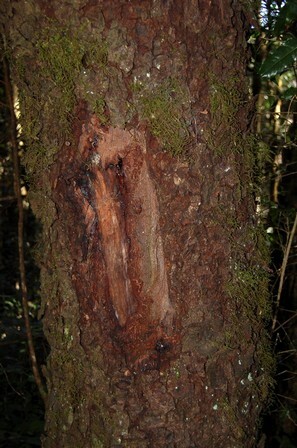 Of the 10 stems located in the forest transects, 70% had been stripped for bark. 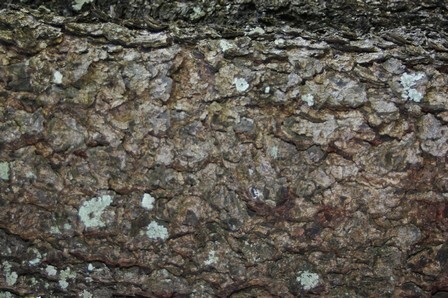 Taylor (1963) found one tree at Embutshana (Nxamalala forest, approx 2930CB) and noted bark removal. Bark harvesting has also been observed in Mpumalanga (e.g. Magoebaskloof) (M. Lotter, pers. comm., 2008). 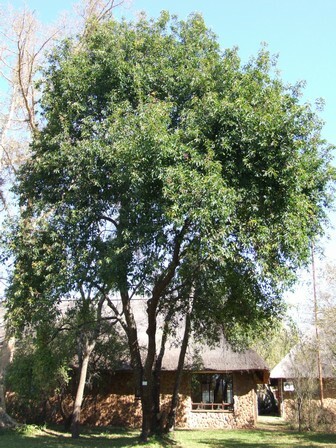 Geldenhuys (2004) commented that the population status of P. africana in Nzamankulu had been severely affected by bark stripping; there were no young stems and only a few seedlings underneath parent trees. It has also been observed that at least half the KwaZulu-Natal forests have lost their P. africana trees, and that stem densities are low in forests where the species is still present (C.R. Scott-Shaw, pers. comm., 2008). Many sites have been "annihilated" and only 1 to 2 trees occur in forests where there should be more (C.R. Scott-Shaw, pers. comm., 2008). Active chopping of stems by locals has also been observed in Umzimkulu forest (M. Ngwenya, pers. comm., 2008). Prunus is still available in the remote but protected Weza forest. The tree is noted to be particularly resilient to harvesting pressure and may exhibit bark regrowth after complete bark removal (Cunningham and Mbenkum 1993), however its resilience to sustained bark harvesting is doubtful. However, in some areas the stems become vulnerable to fungal growth and wood-boring insects (Cunningham et al. 2002). VL. Williams conducted a wound recovery experiment on a single tree in Mpumalanga in 1995. Four squares of bark (15cm x 15cm) were removed, and 11 years later the average wound recovery was 72%. Habitat reduction: Prunus africana is restricted to 'islands' of Afromontane forest in other parts of Africa. The 'islands' have been further reduced by agricultural clearing (Cunningham et al. 2002). Isolated populations on montane islands are becoming further isolated due to the destruction of almost all large, reproductively mature trees from intervening 'islands'. The worst affected population is in Madagascar. 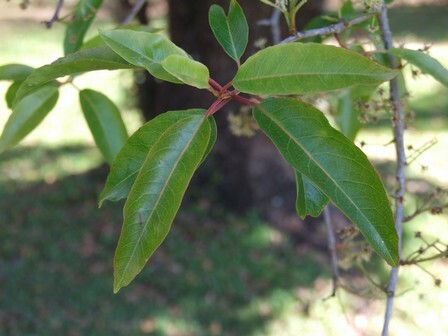 In South Africa, the habitat for Prunus has also declined (C.R. Scott-Shaw, pers. comm., 2008) Timber industry: Prunus was occasionally harvested for timber because it was recorded as being one of 5 species commonly harvested for timber for wagon making in the Amatola forests ± 1902 (McCracken 2004). However, there is little available literature on the value and volume of the trade. It is believed that many trees were removed from KwaZulu-Natal more than 70 years ago (N.R. Scott-Shaw, pers. comm., 2008). Rycroft (1944) mentions the severe exploitation of P. africana in the Karkloof forest. In summary: Prunus africana has been over-exploited for bark products and/or is vulnerable and/or of conservation concern in at least 50% of the countries it occurs in (e.g. Kenya, Tanzania, Uganda, Cameroon, Equatorial Guinea, DRC, Malawi, South Africa, Swaziland and Madagascar). There is a real threat of commercial harvesting for the international trade extending to South Africa in the future due to recent interest, and a continuation of the local exploitation of bark for the local medicinal plant trade. Tree densities in South African localities are low and/or declining (low abundances and scarcities recorded in at least 40% of QDSs). There has been at least a 50% decline in KwaZulu-Natal, and half the forests there have lost their trees. There has been a consequent decline in the Area of Occupancy. There is a possibility that there are less than 10000 mature trees in the country (i.e. approximately 141 mature trees per known QDS) (currently 71 known QDS). Populations tend to regenerate naturally in forest margins and disturbed areas, (Geldenhuys 2001 cited in Grace et al. 2003), but the recruitment rate is low (C.R. Scott-Shaw, pers. comm., 2008) even though seedling densities have been reported to be high in some areas. 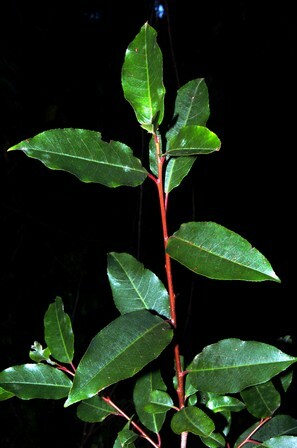 Geldenhuys (2004), for example, reported seedling density in the Nzamankulu forest to be 598 seedlings/ha (ranked 3rd after Rapanea and Zanthoxylum davyi). However, these seedlings were most abundant in a Pinus patula plantation adjacent to the forest patch and seedling density in the indigenous forest patch was low. And, while many young seedlings were found in the area, bigger plants were never found. In the Nzamankulu forest patch, of the 485 seedlings, none >40cm height were found (Geldenhuys 2004). In a 2007 study in the Mpumalanga area, Williams (2007) also observed very little recruitment. Of the six forest sites visited, there were 47-57 trees (>10cm dbh), 5 saplings (<10cm dbh) and >200 seedlings (<10cm high) - however the seedlings were only found under 4 trees. While it seems disturbance favours recruitment, few seedlings survive and become saplings and mature trees. Cunningham, A.B. 1988. An investigation of the herbal medicine trade in Natal/KwaZulu. Investigational Report No. 29. Institute of Natural Resources, Pietermaritzburg. Cunningham, A.B. and Mbenkum, F.T. 1993. Sustainability of Harvesting Prunus africana Bark in Cameroon. A Medicinal Plant in International Trade. People and Plants working paper 2. UNESCO, Paris. Cunningham, A.B., Ayuk, E., Franzel, S., Duguma, B. and Asanga, C. 2002. An Economic Evaluation of Medicinal Tree Cultivation. Prunus africana in Cameroon. People and Plants working paper 10. UNESCO, Paris. Geldenhuys, C.J. 2004. Meeting the demand for Ocotea bullata bark. Implications for the conservation of high-value and medicinal tree species. In: M.J. Lawes, H.A.C. Eeley, C.M. Shackleton and B.G.S. Geach (eds. ), Indigenous Forests and Woodlands in South Africa: Policy, People and Practice (pp. 517-550), University of Natal Press, Pietermaritzburg. Geldenhuys, C.J. and Murray, B. 1993. Floristic and structural composition of Hanglip Forest in the Soutpansberg, Northern Transvaal. South African Forestry Journal 165:9-18. Grace, O.M., Prendergast, H.D.V., Jager, A.K. and Van Staden, J. 2003. Bark medicines used in traditional healthcare in KwaZulu-Natal, South Africa: an inventory. South African Journal of Botany 69(3):301-363. Palmer, E. 1997. A field guide to trees of southern Africa. Collins, London and Johannesburg. Rycroft, H.B. 1944. The Karkloof Forest, Natal. Journal of the South African Forestry Association 11:13-25. Schmidt, E., Lotter, M. and McCleland, W. 2002. Trees and shrubs of Mpumalanga and Kruger National Park. Jacana, Johannesburg. Taylor, H.C. 1963. A report on the Nxamalala Forest. Forestry in South Africa 2:29-43. Von Breytenbach, F. and Von Breytenbach, J. 1983. Notes on the natural forests of Transkei. Journal of Dendrology 3(1&2):17-53. Williams, V.L. 2007. Field Report to Biodiversity International on Prunus africana Bark Sampling Fieldtrip in Mpumalanga Province, South Africa. 9-15 August 2007. School of Animal, Plant & Environmental Sciences, University of the Witwatersrand, Johannesburg. Williams, V.L. 2007. The design of a risk assessment model to determine the impact of the herbal medicine trade on the Witwatersrand on resources of indigenous plant species. Unpublished PhD Thesis, University of the Witwatersrand, Johannesburg.